You can say much the same for a lot of the album, which is decent but not especially above average. The songs are well-played, especially in terms of riffage with guitarists Død and ‘Meathook’ (Ivan Gujić, Tchort having departed in 2011) clearly more than capable musicians from the riff volume unleashed on most songs. Seriously, the sheer torrents of sound coming forth on the likes of Torturewhore are perfect technically, but with little soul or anything to remember it by afterward. Exoneration Manifesto’s melodic lead guitar at the start is a hint of something special, as are the Norwegian lyrics of Dødens Makt, spat out with extra brutality by vocalist ‘Bolt’ (Yngve Christiansen). 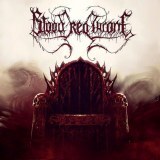 Really, Blood Red Throne have been making the same sort of songs for four albums now, and whilst it’s always solid, it’s getting harder and harder to recommend the band as kings of death metal. In terms of difference between Brutalitarian Regime and this album, though, there are definitely steps forward. Finale March of the Undying alone has the sort of bloodthirsty hunger reminiscent of Cannibal Corpse at their best, but as a whole Blood Red Throne does more to remind you that better exists elsewhere than to propel the band into the major death metal league.